A major UK project to create the most advanced real-world testing environment for connected and autonomous vehicles (CAVs) has concluded. 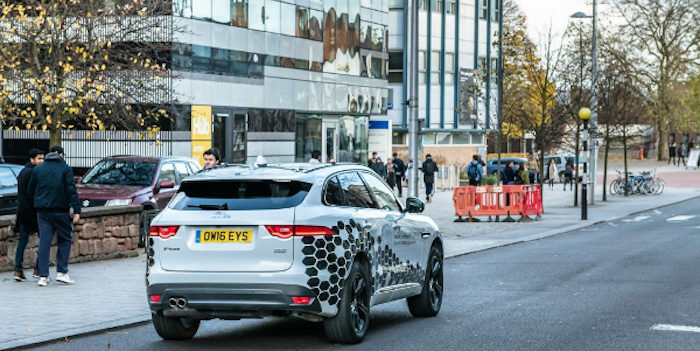 The £7.1m (US$9m) 30-months-long UK Connected Intelligent Transport Environment (UK CITE) project concluded with presentations hat the Coventry Transport Museum and on-road demonstrations using a fleet of Jaguar Land Rover (JLR) connected vehicles. With investment from the government’s Intelligent Mobility Fund and Highways England (HE), UK CITE created a Vehicle-to-Infrastructure (V2X) test environment that included the installation of a network of ITS G5 (wireless) roadside units (RSUs) in Coventry and on the M40, M42, A45 and the A46 road network. The RSUs units enable messages displayed on smart motorway overhead gantry signs to be replicated in vehicles using in-vehicle information (IVI) messages. The messages transmitted include road works warning, traffic condition warning, emergency electronic braking, and emergency vehicle warnings. The UK CITE consortium was jointly led by Visteon Engineering Services Limited and JLR and included Coventry City Council, Coventry University, Highways England, Horiba Mira, Huawei Technologies (UK), Siemens, Transport for the West Midlands (TfWM), Vodafone Group Services, and WMG at University of Warwick. The project team equipped more than 40 miles (64km) of urban roads, dual carriageways and motorways with combinations of three connected vehicle technologies, and tested a fourth LTE-V system. In addition to on-road trialling of the V2X communications, simulation and modelling enabled the consortium to study the impact of connected technologies in different road, traffic and weather conditions, comparing them to non-connected vehicle scenarios. The project also included cybersecurity testing alongside the large-scale trials on a road network, and has helped to establish how these technologies can improve journeys, reduce traffic congestion, and provide entertainment and safety services through better connectivity. Plans are in place to include the UK CITE environment in the Midlands Future Mobility program, an investment of more than £27m (US£34.5m) to create a world-leading connected infrastructure and ecosystem, positioning the region as a center for cutting-edge automotive and communication technologies.